Provide cooling to an AMD Socket A or Intel Socket 370 desktop CPU. 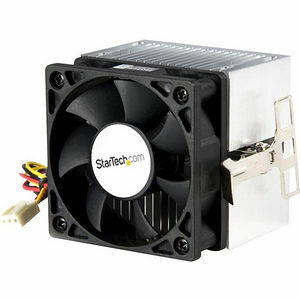 StarTech.com's Socket A cooler is designed specifically for use with AMD Athlon and Duron CPUs. A combination heatsink/fan, the Socket A cooler provides suitable cooling for Duron CPUs up to 1300MHz, Thunderbird Athlon CPUs up to 1333MHz and Athlon XP CPUs up to 2000+.